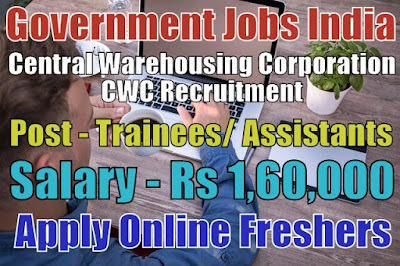 Central Warehousing Corporation CWC Recruitment 2019-20 notification (Ministry of Consumer Affairs, Government Jobs in India) for 571 assistant, superintendent and various posts. All legible and interested candidates can apply on or before (16-03-2019). 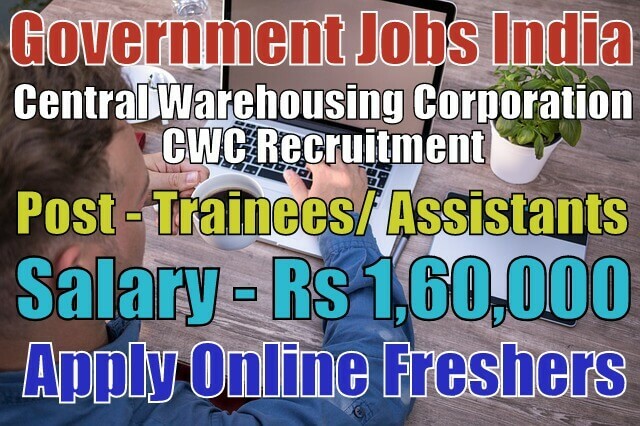 Further information about Central Warehousing Corporation recruitment entrance exam 2019, vacancies, salary details, exam date, CWC recruitment application fee, CWC government jobs in India, educational qualifications, admit card, results and all other details/information about these posts are mentioned in details below. The candidates can get a job in their desired location. The total number of vacancies are 571. 7. Junior Technical Assistant - 238. Salary/Pay and Grade Pay - For management trainee post, the payable salary will be Rs 50,000 - 1,60,000, for assistant engineer, accountant, superintendent posts, the payable salary will be Rs 40,000 - 1,40,000, for junior superintendent and Hindi translator posts, the payable salary will be Rs 11,200 - 30,600 and for junior technical assistant post, the payable salary will be Rs 10,500 - 28,690 per month. Further information about salary details is mentioned in the detailed advertisement. Age Limit - For CWC recruitment, candidate age should be less than 30 years. To know more about age details, click on the detailed advertisement. Selection Method - For recruitment in Central Warehousing Corporation, the candidate will be selected on the basis of their performance in the online test, document verification and then personal interview. Candidates must be prepared for these tests. How to Apply - All legible and interested candidates have to apply online from official website http://cewacor.nic.in or from the given link below. At the time of interview, candidates should carry their educational qualification certificates, personal details including permanent address with a PIN number, personal valid email and a personal mobile number. Candidates have to register themselves online. Candidates have to apply via online mode only. Applications sent via offline mode will be summarily rejected for sure. The online registration for this recruitment is starting from (15-02-2019). Last Date for Submitting Application Form - All candidates must apply on or before (16-03-2019). After the last date, no application form will be submitted. Syllabus and Books for CWC - The syllabus and books for the post of Management Trainees, Assistant Engineers, Accountants, Superintendent, Junior Superintendent and assistants is mentioned in the given link below. Application Fee - The application fee will be Rs 1,000 for General/OBC category candidates and Rs 300 for SC/ST/PWD category and women candidates. Regular employees of Central Warehousing Corporation CWC applying for the higher position are also required to pay the application fee. Candidates have to pay the fee online via credit card, debit card or net banking. To know more about application fee details for this recruitment, click on the detailed advertisement.